Graduate from reporting to delivering results with real-time visibility into the health of your business. No more manual forecasting. 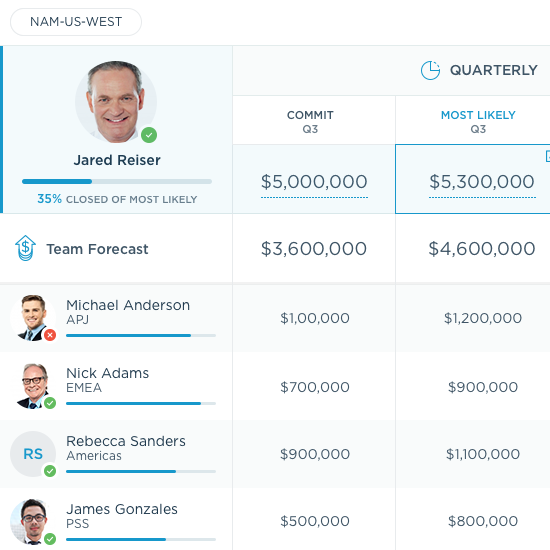 Cut your forecast prep time in half and call your number based on a real-time roll up across teams and geos. See all the deals that make up the forecast to quickly identify risk and how to mitigate it. Rise from the day-to-day tactics and plan into future quarters. Leverage historical conversion patterns to determine pipeline gap and what you can do about it. Forget the powerpoints and spreadsheets. Make every QBR, forecast call, and board meeting data-driven, productive and actionable with with real-time deal data and activity analytics. Bring all go-to-market teams into one common data set to break through bottlenecks in the funnel and see what they need to do to optimize programs and win key accounts. Leverage automation and AI to capture and sync business activity and contact data from dozens of business systems to significantly improve data quality without bogging down the team with CRM updates. Monitor sales rep activity data to establish benchmarks for what successful reps are doing, and coach middle-of-the-pack reps to perform like the top ones.